If you just got started in Xcelsius or are an intermediate user, these recorded webinars will be of great help. Mike Alexander of DataPig technologies was kind enough to share these webinars on his website. You can watch them for free. 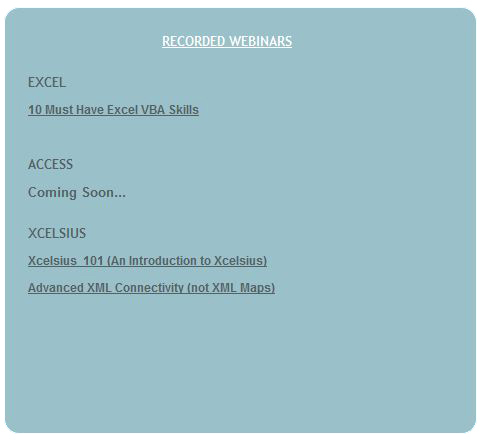 Apart from the Xcelsius webinars, if you are interested, there is also a recorded webinar on 10 Must Have Excel VBA Skills. Click on the image below to go to the free webinar page. Posted in: Announcement, Excel, Webinar, Xcelsius 2008. ← How to create a Radar animation using Xcelsius?